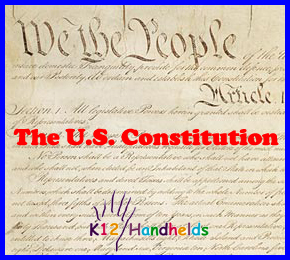 This introduction tells why the Constitution is being written. It is being written to make a better country. Article I talks about the legislative part of our government. The legislative branch makes laws. In the United States, this is called the Congress. The Congress has two parts: the Senate and the House of Representatives. This section tells how members of the House of Representatives are to be chosen. It also says that the number of representatives from each state will be based on how many people live in that state. Larger states have more representatives. Members of the House of Representatives are elected for two year terms. This section tells how members of the Senate are to be chosen. Each state has two senators. Senators are elected for six year terms. The method of holding elections for Congress is to be decided by the states. The Congress must meet at least once each year. Each house of Congress can make its own rules. At least half of the members must be there to do business. Neither house can adjourn (stop meeting) without permission of the other. Members of Congress are paid for their work. They cannot be arrested while serving, except in case of a serious crime. They cannot hold another government office while they are a representative. This section discusses how laws are made. A bill is a proposed or suggested law. To become an actual law, a bill must be passed by both houses and then signed by the president. If the president doesn’t approve the bill, the bill must be passed again by at least two-thirds of both houses of Congress to become a law. This section lists the powers of Congress. They include the power to collect taxes, to borrow money, to print money, to run the post office, to declare war, and to make laws necessary for carrying out its powers (the “elastic clause”). This section lists limits on Congress. For example, Congress could not prohibit importing slaves before 1808. Congress cannot pass a law that punishes people for actions before the law was passed (“ex post facto” law). Congress can only spend government money approved by law. No one can be made king or given other royal titles. This section lists the limits on states. States cannot enter into treaties or print their own money. They cannot keep troops or have a war without the permission of Congress. Article II talks about the executive part of our government. The executive branch enforces laws. In the United States, the executive branch is made up of the president, the vice president, and cabinet. This section discusses how the president is to be elected and the qualifications for president. This section lists the powers of the president. They include being the Commander in Chief of the armed forces. The president also has the ability to grant reprieves and pardons (forgiving someone for a crime), except in cases of impeachment. The president can make treaties and nominate various officials, subject to the approval of Congress. This section lists more responsibilities of the president. He must update Congress on the state of the country in the State of the Union speech. He must make sure that all laws are carried out properly. This says that the president and vice president can be removed from office by a process called impeachment. Article III talks about the judicial part of our government. The third branch of government is the judicial branch, which interprets laws or says what they mean. In the United States, the judicial branch is the Supreme Court and other lower courts. Judges in these courts serve for life and are paid a salary. Most court cases are first tried in lower courts in the states where the crime was committed. They are tried by jury. Then they can be appealed (or reviewed and retried) in higher courts. The Supreme Court is the highest court. The Supreme Court hears cases involving the Constitution, ambassadors, the federal government, or between states. This section defines treason. Treason is waging war against the United States or helping its enemies. Congress can decide the punishment for treason. Article IV talks about the states in this nation. “Full faith and credit” means that each state must accept other states’ laws and court decisions. This section says that new states may be added to the nation, subject to certain rules. Congress makes rules for territories or other federal land. The federal government has the responsibility for protecting the states from invasion or violence. In addition, all states are guaranteed a democratic government. Article V talks about how amendments (or changes) can be made to the Constitution. An amendment may be proposed or suggested by a vote of 2/3 of both houses of Congress. Two-thirds of state legislatures can ask for a constitutional convention. After that, an amendment must be approved by 3/4 of the state legislatures or by 3/4 of special conventions in each state. Article VI says that any debts of the United States before the Constitution are still valid. It also says that the Constitution is the “supreme law of the land.” All laws and court decisions must agree with the Constitution. All government officials must support the Constitution. Article VII says that nine states must ratify (or approve) the Constitution for it to become law.